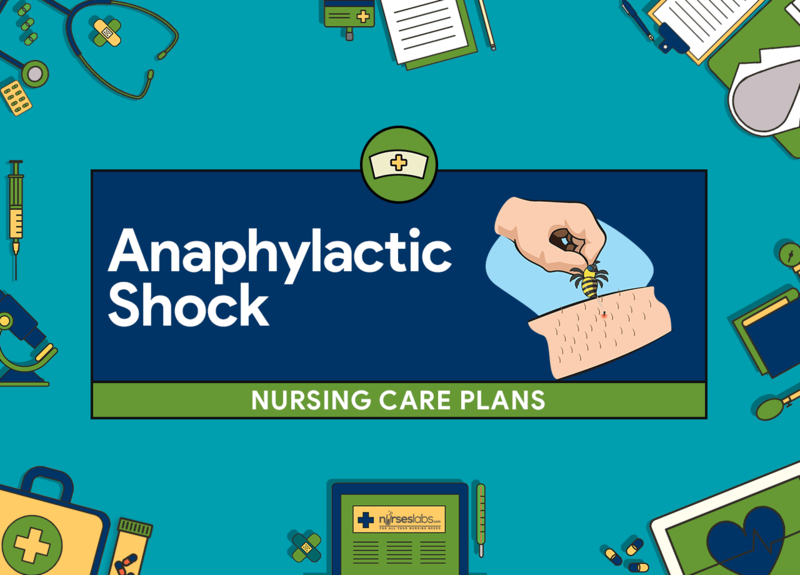 Anaphylactic Shock also known as distributive shock, or vasogenic shock is a life-threatening allergic reaction that is caused by a systemic antigen-antibody immune response to a foreign substance (antigen) introduced into the body. It is characterized by a smooth muscle contraction, massive vasodilation and increased capillary permeability triggered by a release of histamine. It occurs within seconds to minutes after contact with an antigenic substances and progresses rapidly to respiratory distress, vascular collapse, systemic shock, and possibly death if emergency treatment is not initiated. Causative agents include severe reactions to a sensitive substance such as a drug, vaccine, food (e.g., eggs, milk, peanuts, shellfish), insect venom, dyes or contrast media, or blood products. Anaphylactic shock is a medical emergency that requires immediate attention and intervention. Nursing care management is dependent on the severity of the initial reaction and the treatment response. Client will maintain an effective breathing pattern, as evidenced by relaxed breathing at normal rate and depth and absence of adventitious breath sounds. Histamine is the primary mediator of anaphylactic shock. It causes smooth muscle contraction in the bronchi as a result of the stimulation of histamine receptors (H1). As the anaphylactic reaction progresses, the client develops dyspnea, wheezing, and increased pulmonary secretions. Vascular to interstitial fluid shifts to contribute to respiratory distress through swelling in the upper airways. Auscultate breath sounds. By auscultation, wheezing can be heard over the entire chest. But when the bronchial constriction worsens, there will be decreased audible wheezing and respiratory distress will heighten. Therefore it is also important to auscultate for decreasing air movement. Assess the client’s anxiety level. Life-threatening situations such as respiratory distress and shock can produce elevated levels of anxiety within the client. Assess the client for the sensation of a narrowed airway. Systemic antigen-antibody immune response can result in severe bronchial airway narrowing, edema, and obstruction. As airway gets narrow, client demonstrates increase respiratory effort. Observe for changes in color of the skin, tongue, and mucosa. Bluish discoloration of these body parts is considered a medical emergency. Assess the presence of angioedema. Angioedema is characterized by the swelling of the skin, lips, tongue, hands, eyelids, and feet. Monitor oxygen saturation and arterial blood gasses. Pulse oximetry is used to monitor oxygen saturation. It should be kept at least 90% or higher. As shock progresses, aerobic metabolism stops and lactic acidosis occurs, resulting in the increased level of carbon dioxide and decreasing pH. Maintain a calm, assured manner. Assure the client and significant others of close, continuous monitoring that will ensure prompt intervention. The staff’s anxiety may be easily perceived by the client. The client’s feeling of stability increases in a calm, non-threatening environment. The presence of a trusted person can help the client feel less threatened. Provide assurance and alleviate anxiety by staying with the client during acute distress. Air hunger can produce an extremely anxious state that leads to rapid and shallow respirations. Instruct the client to breathe slowly and deeply. Focus breathing may help calm the client, and the increase tidal volume facilitates improved gas exchange. Position the client upright. This position provides oxygenation by promoting maximum chest expansion and is the position of choice during respiratory distress. Administer IV fluids as ordered. Hypotension caused by vasodilation and distributive shock responds to fluid resuscitation. Administer oxygen as prescribed. Oxygen increase arterial saturation. Oxygen saturation that is less than 90% results to tissue hypoxia, acidosis, dysrhythmias, and changes in the level of consciousness. These medications reduce bronchospasm and help open the airways in the lungs by relaxing smooth muscle around the airways. Steroids stabilize the cell membrane and decrease cellular permeability, vasomotor response, and inflammation. Epinephrine is the cornerstone of anaphylaxis management. It is fast-acting and relaxes pulmonary vessels to improve air exchange and stabilizes cellular permeability. These medications block the action of histamine and decrease cellular edema. Maintain a patent airway. Anticipate an emergency intubation or tracheostomy if stridor occurs. Respiratory distress may progress rapidly. If laryngeal edema is present, endotracheal intubation will be required to maintain a patent airway. Provide information about emergency medications and plans that should be considered should a crisis reoccur. Assist the client and/or family in identifying factors that precipitate and/or exacerbate crises. Knowledge can facilitate prompt intervention.